"Nuclear Fishin" ..... 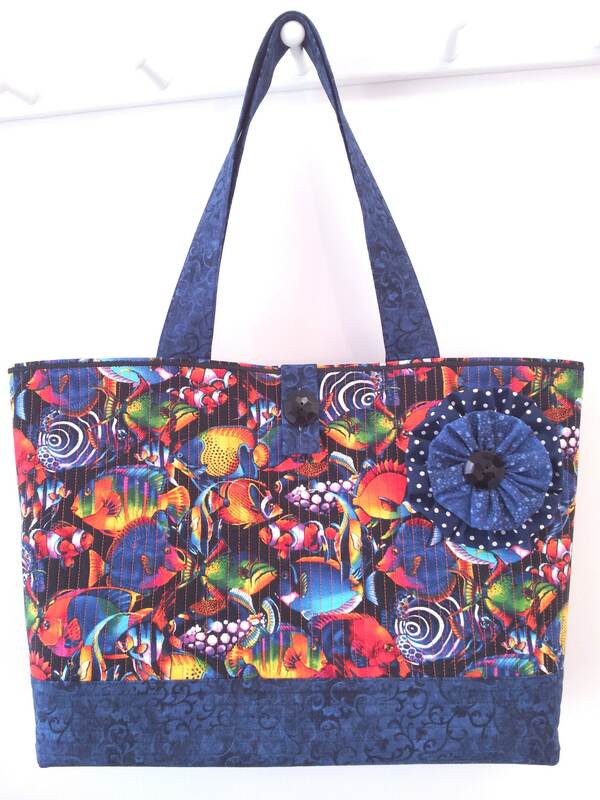 THE BAG - Features a variety of exotic, tropical fish like Clown and Angel fish, Oscars, butterfly fish, tangs, blue damsels, hamlets and more in bright, vivid shades of blue, orange, hot pink, green and yellow all scattered on a jet black background. Trapunto stitched quilting on many layers give this cotton cloth bag the integrity and body of a leather. Adorned with a 5" double yoyo flower with a black faceted button - what I'm calling the "Calico Corsage". 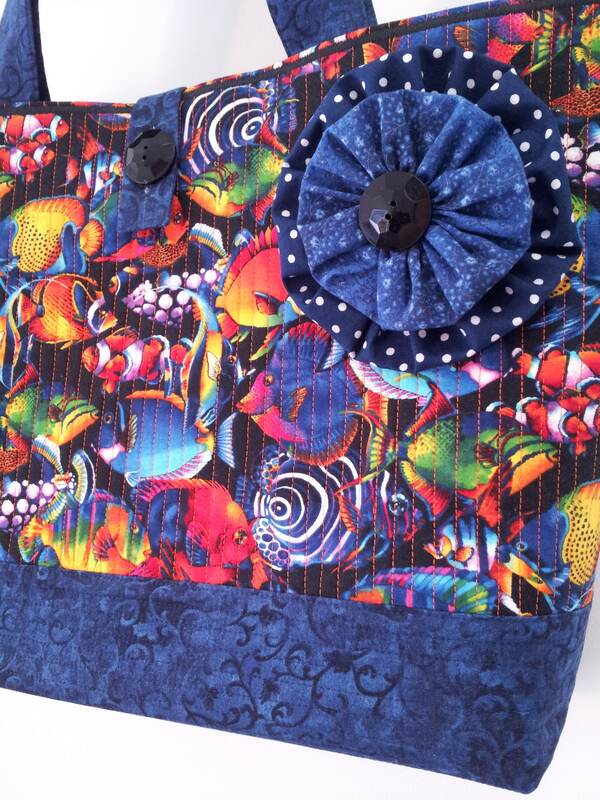 It is mounted on a pin-back so it can be re-positioned anywhere on the bag, a blouse, or on your matching hat. This bag matches the "Nuclear Fishin", "Deep Blue Sea" and "Navy Dots" baseball caps. 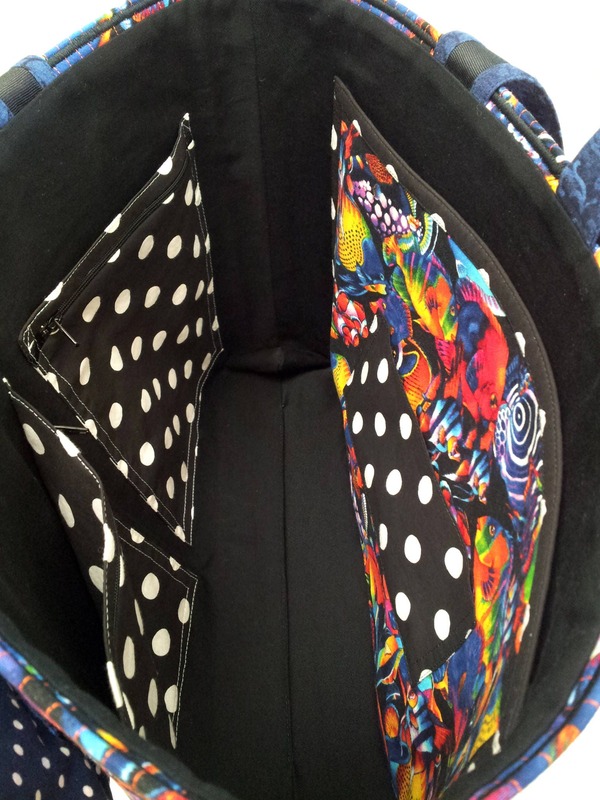 Coming soon will be an "Indigo Swirl" baseball cap that matches the bottom half and straps of the bag. Width at Top = 19"
Width at Bottom = 15"
Height (bucket: bottom to top) = 12.5"
Comes packaged in a glossy white windowed gift box. Handmade in 100% cotton. Machine wash/dry.